Look in just about any motorcycle manufacturer’s catalogue from the 1930s and you’ll find a competition model listed. Designed for the man who liked to ride to work during the week and enter off-road trials on Saturday or Sunday, these bikes usually featured knobbly tyres on 21in wheels, high-clearance mudguards so that they didn’t get clogged with mud, a crankcase shield to protect the engine against rocks, a high-level exhaust pipe, and wide handlebars for better control when the going gets tough. Weight was saved by using open chain guards instead of fully enclosed cases, and lights would be an optional extra. 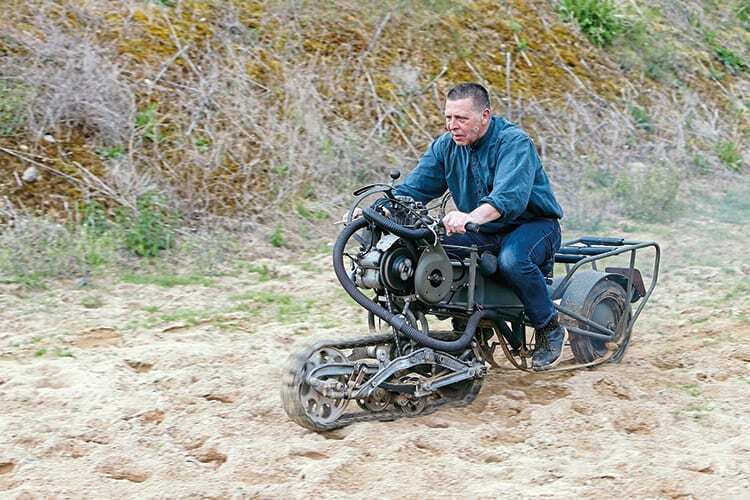 But Adrien Mercier decided there was another way to build the ultimate go-anywhere motorcycle. Based in Lausanne, the Swiss inventor looked at the tank for inspiration. These heavy armoured vehicles first appeared during the First World War and could be driven right over enemy trenches thanks to the use of caterpillar tracks instead of wheels. Developed in secret, the British public was told that they were huge water carriers, or tanks, and the name stuck. By the mid-1930s every advanced army had its own tanks.